I really like the concept of the exterior design of the cafe outside with a number on the door that gives you the illusion of entering into a different room when you open the doors. Kind of like Alice in the wonderland and it really does make you feel like you're in a magical wonderful when you walk around the outside of the cafe and exploring each little area and looking closely at all the details. Also love love love the inside interior design with 3 room concepts with different furnitures and wall decorations. The teapot lights are the cutest lights ever! There is even a merchandise section where you can buy all sorts of things from the cafe such as food, cups, bags and accessories. Everything was sooooo cute that I wanted to just buy them all! What's even cuter is how they serve their desserts on their plate. It is like a piece of art! They make their desserts look like a jewelry piece that is yummy and delicious that you can eat. My friend and I got a plate set where we each get 5 pieces of dessert and we get to choose a flavour for the macaron, cupcake and ice cream along with a set drink for about $20. I got all strawberry flavour with flower garden tea! Even their washroom design is SO CUTE that I couldn't resist taking a selfie with the tooth shaped mirror, lol. 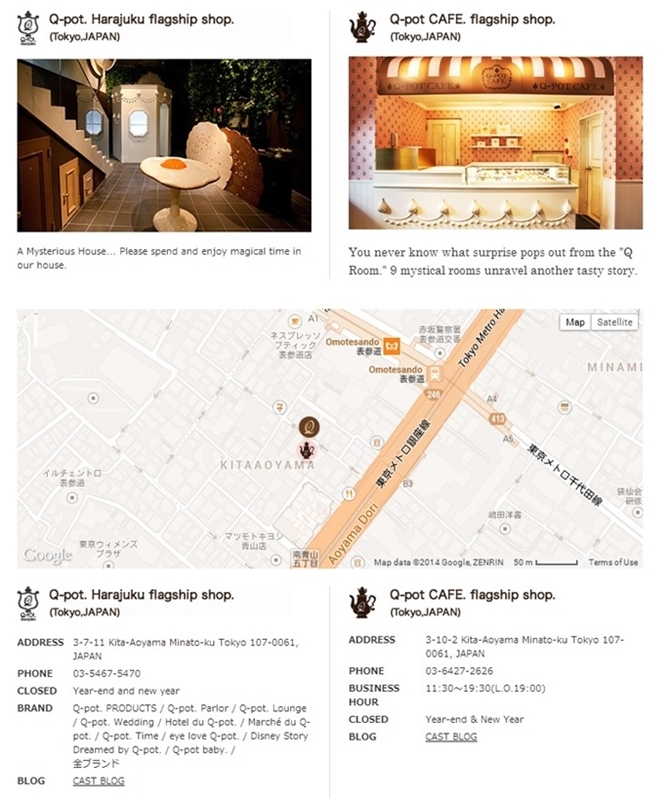 You can even visit their flagship shop which is literally located right across from the cafe. Taking pictures at the flagship shop actually wasn't allowed. There were signs posted with no pictures allowed but I managed to snap a few pics before a staff caught me, lol. The flagship shop basically sells some really cute and expensive accessories that are not sold at the cafe. I have also recorded a short video tour of the cafe. How to get to the Q-Pot Cafe: The cafe is kind of hidden in a side street so I'm not sure how to give proper directions of how to get there. I used google map to help me. But basically it's located in Harajuku on Omotesando street and the closest station will be Omotesando station. You'd walk in the direction to where Kiddyland is and you turn in this side street before you reach Kiddyland and the cross bridge in the middle of Omotesando street. You walk into the side street and turn left on the first corner street and you'll see a 711 and just walk down a bit from 711 and you'll see the cafe. I'd advise putting the address into google maps and just let it guide you after you get off at Omotesando station. I bought a bag of flower garden tea and cup and a small pouch from the cafe.